I am not responsible for broken parts or engines. Put the sandwhich bags on all your filters, such as iceman, or the little breather filter alot of people put on their valve covers. You dont want them to get wet. Rubber bands work to help keep the bag tight and snug. Spray the engine off once it's cooled down. (Not Spraying directly on ket electrical parts, ie. pcm, and fuse box) After Spraying with water. Use the simple green on the motor and let it soak for a few minutes. Spray it off well, and dry it. Use the dry rag or clothe to soak up the water and dry it off the best you can. You can use the cue tips if you want to get the dirt out of those hard to reach tiny spots. After that Spray the entire engine bay with Armour All Tire Shine. Make sure its the foaming kind, this really make all the plastic, rubber and even metal shine nicely! This is really the key step to the process. After letting the Tire shine soak for about 5 minutes, go ahead and turn on the car and let it run. While the motor warms up the foam will completely disapear. Oh yea, take the bags off your filters and if you want to spiffy it up, use the Aluminum Polish to shine up the aluminum parts. Thats about it, simple and does wonders to an engine bay. spray nine or roll off also does wonders just incase you don't have simple green. Or Formula 21/2001 by Turtle Wax. Simple Green is just what Ive used in the past. Many cleaners/degreasers will work. stkneon wrote: Or Formula 21/2001 by Turtle Wax. yep, what ive always done was wrap up any electrical/filter elements in plastic bags, hose off the enginebay with the hose (not pressure washer). 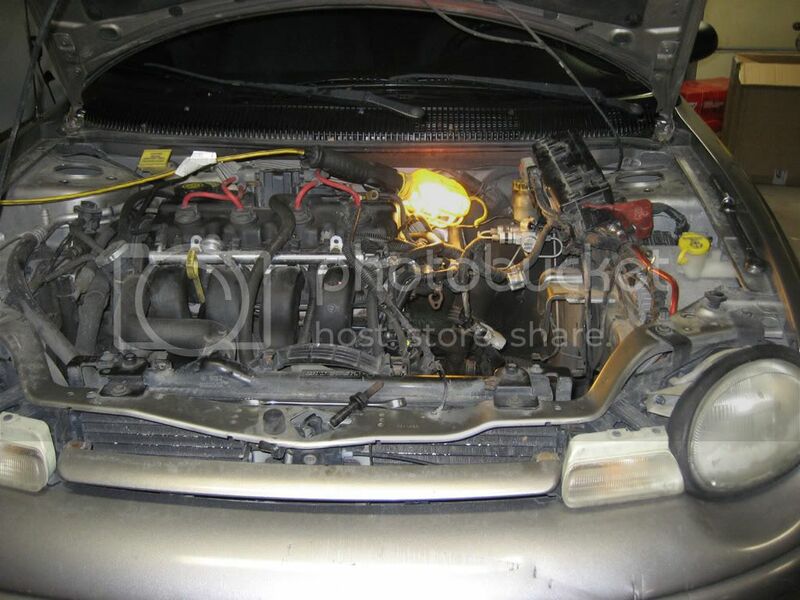 run the engine to operating temp with the hood closed, then turn the car off, top it off with a spray of 2001 and close the hood and let it dry, when you next check it, it looks brand new. note if you use too much 2001 youll have to wipe off the excess that didnt dry. havent done this to my 1g because well theres no motor in it anymore =P but i did do it to my 2g before a show. i cant find my before picture, but trust me it was bad. I used Formula 21.. Couldn't find 2001 at AutoZone..
Not a fan of simple green had to many bad experiences with it. I prefer formula 1 products and elbow grease. Car Brite products is all I use but it helps to get all my stuff for free! Quick tip....be careful when spraying any kinda of degreaser on raw metals. It'll discolor them in a hurry. This is from my first neon i owned ..
...oh ya welcome tom glad to see you made it here. I've had a few problems with simple green. it makes some plastics look hazy or lighter color after it does that never looks just right. brake cleaner<-- even though i havent done it since i have been up here. 96 slow dumb and stupid. wow ... you guys make me think there is hope for my engine bay. MarkyMark wrote: wow ... you guys make me think there is hope for my engine bay. meh ... I treat my car well but people around me do not. I don't guess it's that bad ... I powerwash the motor once a week in the summer and it still looks like this. Doesn't seem to want to come clean.